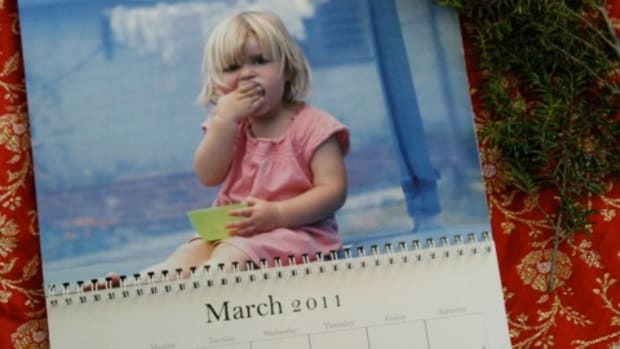 I’m ashamed to admit that last years Christmas cards went out somewhere around the 22nd of December - not even a magician could make them arrive in Australia for the big day, what with the time difference and all. This year I plan to shock family and friends by rebelling against my usual disorganized state and sending handmade holiday cards early on in the season! Want to join me? Read on for some easy-peasy-lemon-squeezy (yes, i did just say that) ideas for fun, unique and impressive handmade holiday card ideas! If the mere thought of homemade cards makes you shudder and rush straight to costco.com, pause for a moment, maybe take a deep breath! Think back to the cards you received last year. Did you keep any? Most likely the ones you loved the best were handmade or designed by the sender! 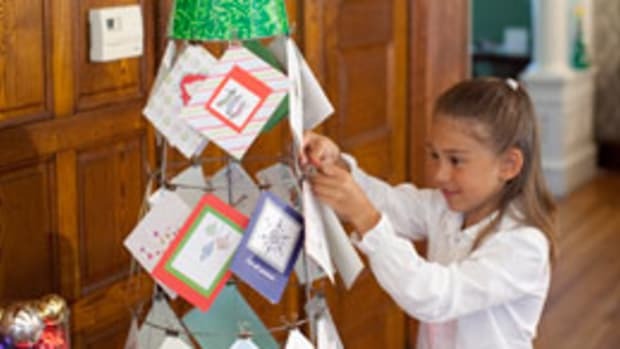 Making your own cards is not only satisfying, impressive (come on, you know your friends will wonder how you did it), and cost-effective...but a great project for the family to be involved in and kick-off the holiday season with some crafty times. Pop on some festive music or movies one weekend, get a big bowl of popcorn and have a procession line of cardmaking with your children - i guarantee you’ll be making memories to last a lifetime. There are many products available to ease your cardmaking session - my favorite is packs of pre-folded and scored solid cardstock cards with matching envelopes. I can adhere a photo or fun embellishment and words to the front of the card and call it a night! Simple tasks for little ones like glueing, stamping, drawing, or adhering the postage stamps will keep hands busy while you and older children cut, fold, punch, paint, sew etc etc - oh the fun you will have! 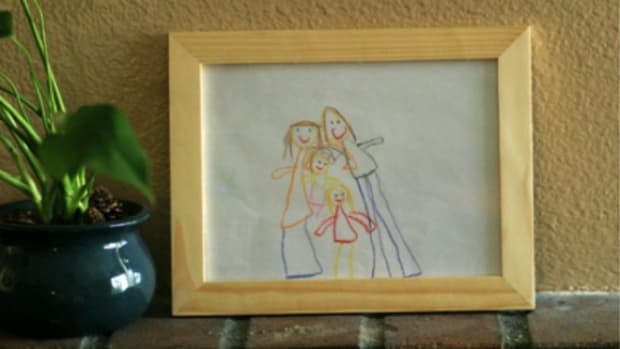 A simple and sweet idea for a card is to get your children to draw or paint a picture/scene, then make color copies of their artwork to stitch onto a card. *Stamp a christmas stamp and have your child paint or color in the image. 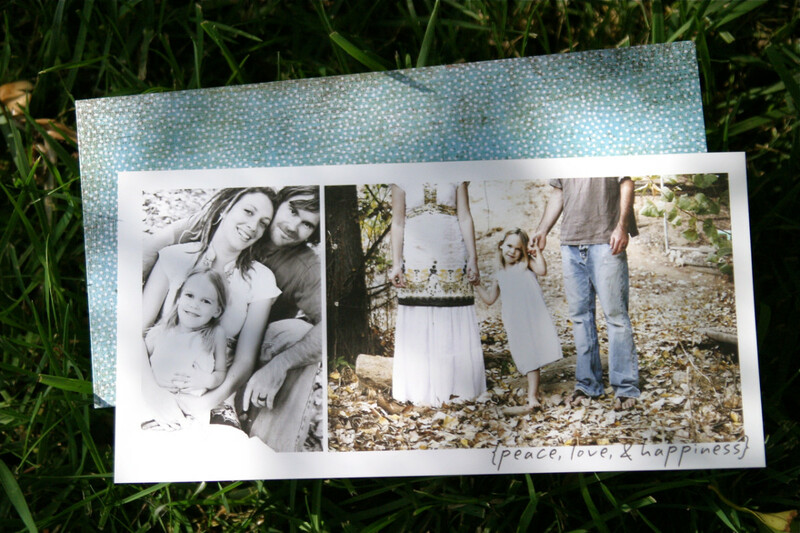 *Gather old cards from previous years or wrapping paper and have your child make collages from the images. Use these as postcards or to embellish the front of a card. *Make your own potato stamps - use simple shapes such as stars, christmas trees, hearts. 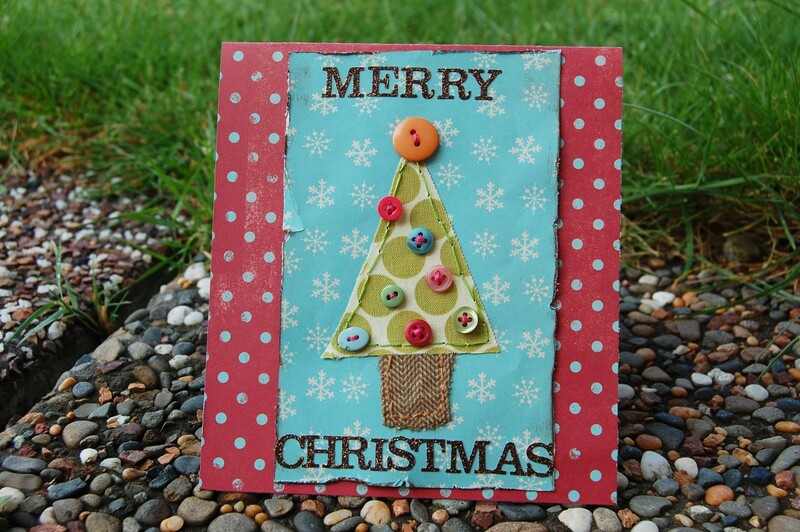 Dip in acrylic paints and make all kinds of fun cards and gift wrap! *Buy (or make your own) holiday confetti/sparkles and let little fingers sprinkle some into each envelope. *Tie cinnamon sticks with ribbon and use to embellish a card, or add to the envelope to make a yummy smell! *Have them paint/draw/put stickers on envelopes. Then address envelopes later with a label sticker over the top. 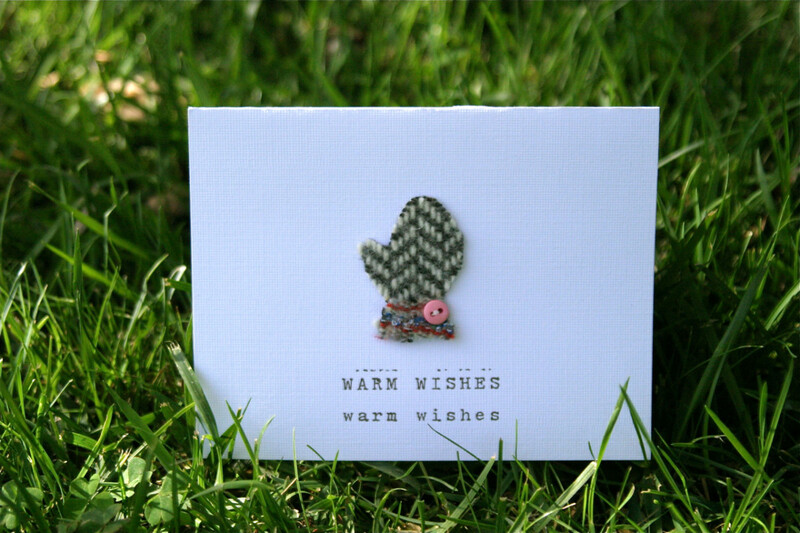 Mama of two Vicky Gibson from New Zealand designed this adorable card with some scraps of fabric and buttons, something easy to replicate and so cosy to receive! Cut christmas pattern paper to size, distress and ink edges. Cut tree shapes out of fabric (triangle and rectangle). Lightly adhere to paper and backstitch around the edges. Sew buttons onto tree for ornaments. 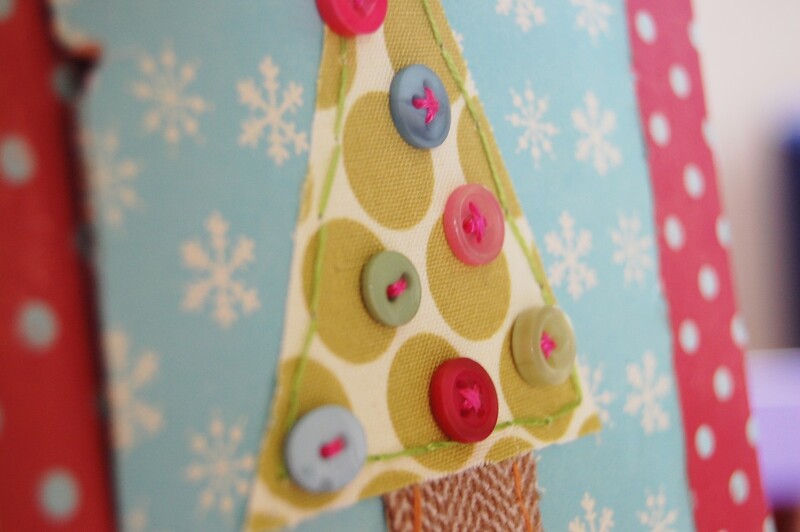 Attach tree/paper to your pre-folded card with double sided tape. 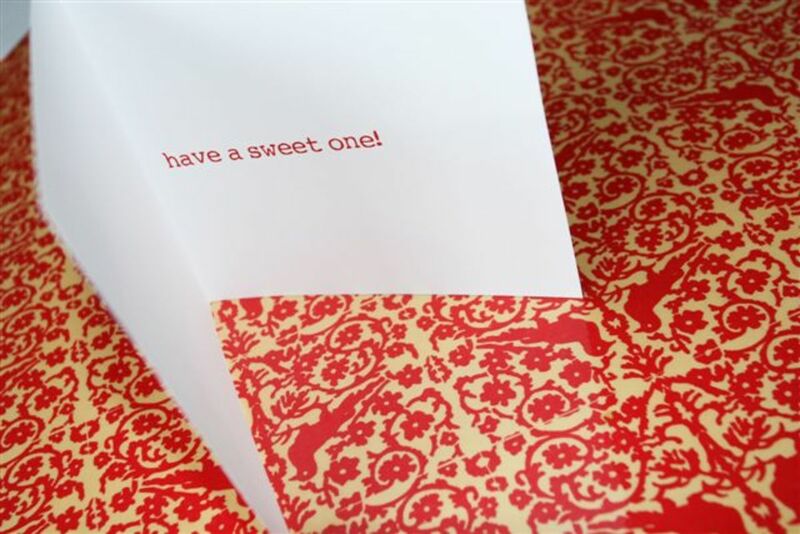 *Stamp or print your greeting onto textured cardstock, fold/score to form a card. *Cut mitten shape from wool fabric. *Sew small button to mitten with embroidery thread. *Adhere mitten to card with liquid craft glue or hot glue gun. Digital Kits used are "Beetle Juice" by Chelsea Parsons and "Cupcake Christmas" by Cherie Mask from Two Peas in a Bucket. *Open a new document in photoshop. Chelsea wanted a square card so chose a 6 x 12” format. 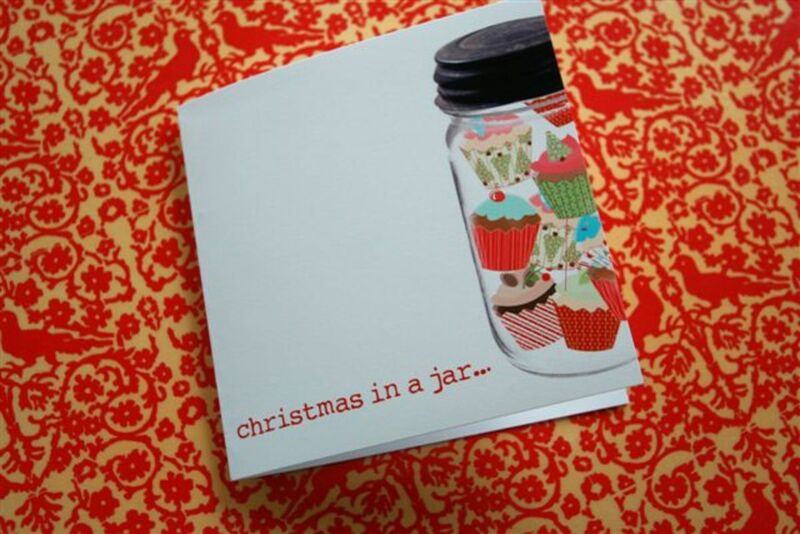 *Open cupcake and jar images, drag and drop them onto the page and resize them as desired (be sure to layer the jar on top of the cupcakes to create the effect of cupcakes IN the jar!). *Add text for your greeting. *Print, then flip card over to run through the printer again for inside text. Fold and score card! Everyone loves to see a good old family photo at Christmastime. Include it with your card, or make the photo BE your card...start thinking up creative photo opportunities to have something uniquely you this season. Forgo the matching reindeer sweaters and sweet smiles posed perfectly by the fire and let your families personality shine! *Buy wood letters at the craft store to spell out a word and incorporate into your photo (children can each hold a letter, line the word up at your feet, hang the letters from a tree etc). *Santa hats for one and all - take them to the beach, the park, your favorite local hangouts. *Buy giant candy cane ornaments for props in your picture. Line them up, have each child hold one, have candy canes in the foreground in focus and your family behind etc. 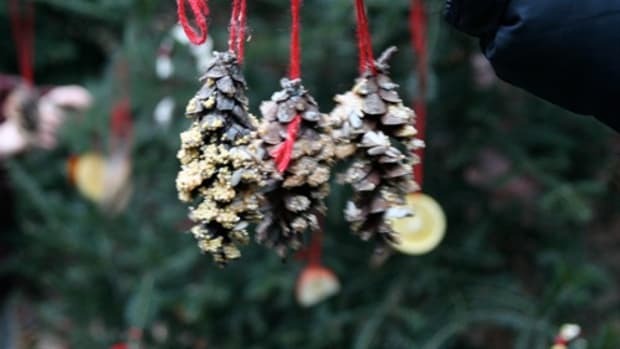 *Decorate a tree in your yard or park with giant ornaments and stand beneath for the picture. 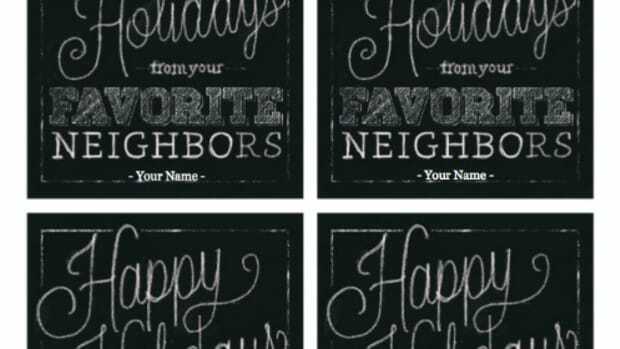 *Write your holiday greeting on a large chalkboard, pavement or wall and pose around the message. *If you live near the beach write your greeting in the sand! *Visit a pine forest or tree farm to sit amongst the beautiful greenery for a casual and fun photo. *Peek little faces through a wreath. *Have each family member choose a favorite ornament from your stash and include in the photo, or take close-ups of small hands holding the ornament. *Make a gingerbread house replica of your own house (you know you want to!) for the family to hold together. 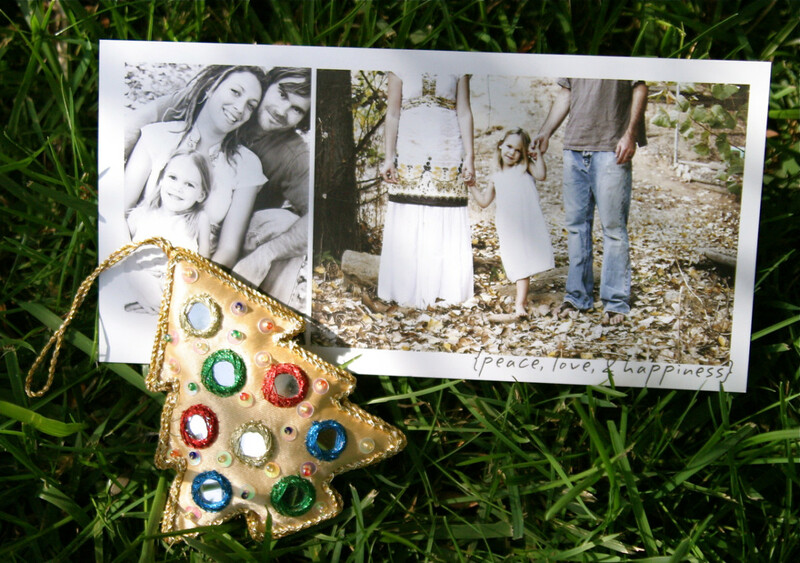 *Create a collage of Christmas photos from previous years for a blast from the past! 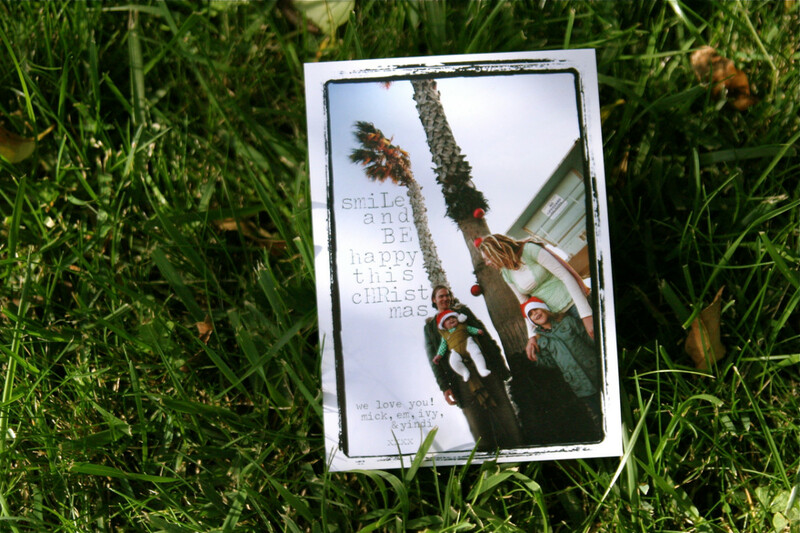 The simplest of cards can be a printed photo - either sent as a postcard with a message layered on top, or adhered to a pre-folded card to hold a message inside. *Cut patterned cardstock to desired size (card is not folded, so cut to slip inside an envelope). 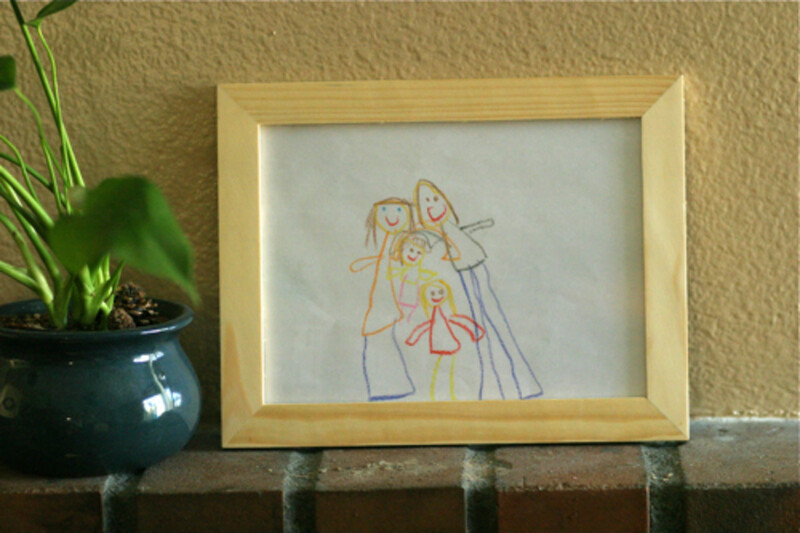 *Trim picture and adhere to cardstock. *Print words onto textured cardstock, trim into strips and lightly adhere with gluestick. *Use zig-zag stitch on your sewing machine to secure strips. *Staple pretty piece of ribbon as a decorative element to the side of the card. *Open a new page in photoshop in desired size (check to see what photo size printing options your lab offers). *Add chosen pictures and resize them to fit. *Send to photo lab for printing! 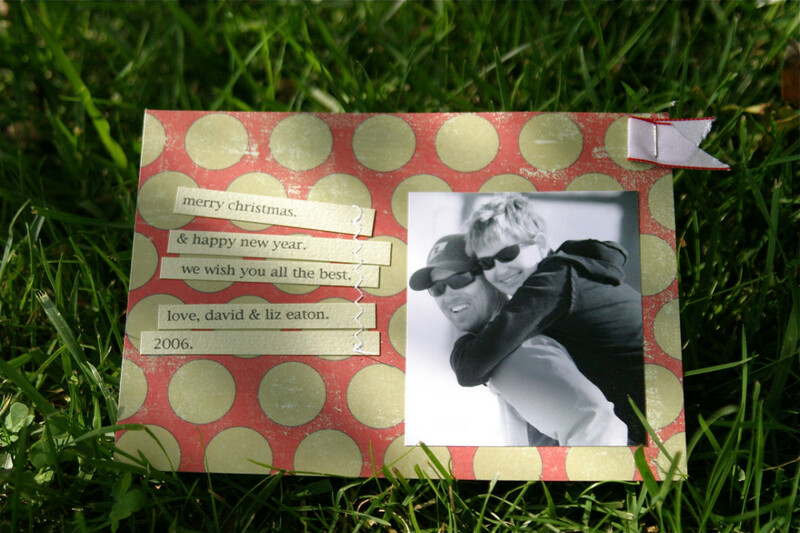 *I then adhered the photo to some patterned paper to handwrite a personal message on the back of each card. This card was created in much the same way - but with a digital border added to the edge of the picture, and text ontop of the photo. 4x6 inches in size, it was under 20c a picture to print! So dust off the scissors and get some pretty envelopes for inspiration - gather your kids, a friend or two...and throw yourself into the holiday season this year! And, you know - for those of you who kept reading about the handmade even though you didn’t want to...here’s a little treat for you - some cool holiday card template links...incase you find yourself in my shoes last year, on the 20th...thinking up card ideas...enjoy!